Instructions: Create a card base from white card stock measuring 5" x 7". Next select the patterned papers you wish to use in your background. Die cut a curved eyelet edge onto one larger piece of paper using the Eyelet Border Basics Die. Next, measure out the approximate sizes you will need for the other two layering pieces, both will remain having straight edges. Die cut an eyelet trim border piece from white card stock that coordinates with curve of the piece of patterned paper. Adhere it to the back of the patterned piece as a second eyelet layer using dries clear adhesive as shown. Die cut the lace like accent piece from the Sweetheart Borders Die from white cardstock. Trim down to the size you wish to use as accent on background. Adhere to back of layering piece using a dries clear adhesive as shown. Adhere your layering pieces to the card base as shown, beginning with the center most section so the other die cut accents overlap. From white card stock, die cut the large frame from the Intricate Swirls Frame Die, and one banner from the Arrows and Banner Die. Using Ranger Archival Ink Pad - Jet Black, stamp sentiment found in the Cheerful Note Sentiments Cling Stamp Set. Using Stack and Store Dauber, ink all edges of banner using Ranger Archival Ink Pad - Deep Purple. Using a dimensional foam or pop dots, adhere frame and sentiment banner to card front as shown. Stamp one inking of each of the illustrations found in the Patchwork Daisy Border Cling Stamp Set, onto white card stock using Ranger Archival Ink - Deep Purple. Color leaves on all stamped images using Stack and Store Daubers and Ranger Archival Ink - Leaf Green. Color daisies on large border die cut using Stack and Store Daubers and Ranger Archival Ink - Forget-Me-Not. Color smaller daisy flourish flowers using Ranger Archival Ink - Deep Purple. Die cut all images using coordinating dies. For large daisy border embellishment, using a scissor, snip entire border free so you have a free standing embellishment. Shape all embellishments slightly using Deluxe Flower Shaping Kit. Stamp one inking of the mid sized and smaller daisies found in the Buttons and Blooms Cling Stamp Set, onto white card stock using Ranger Archival Ink - Deep Purple. Color two smaller blossoms using Ranger Archival Ink - Buttercup, and one mid sized flower using Ranger Archival Ink - Cactus Flower. 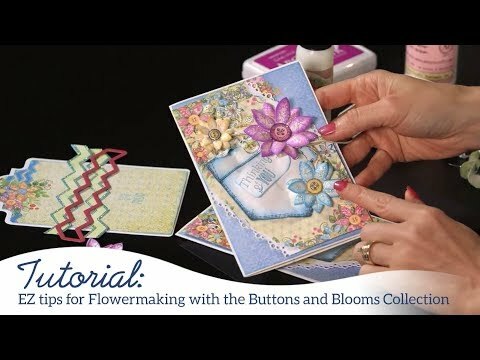 Die cut using coordinating dies, and shape slightly in the center using your Deluxe Flower Shaping Kit. 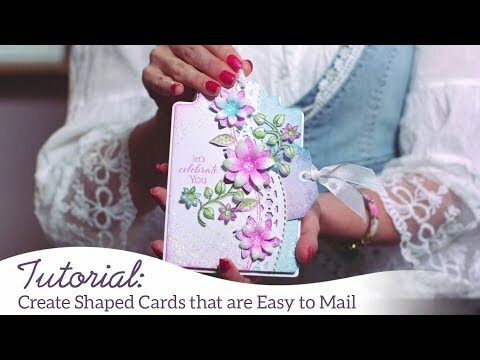 Adhere smaller daisy flourish to top of card front, and larger flourish to bottom. Adhere daisy border die overtop as shown. Layer small yellow daisy flowers over daisy images on top and bottom of border, and the larger pink flower in center.